Maundy Thursday is observed the Thursday before Easter Sunday and commemorates Jesus washing the Apostles’ feet and establishing the Lord’s Supper. John’s Gospel is the only Gospel that recounts the footwashing. In this post, I make a couple observations on John 13:1-30. John 13:1-30 introduces a larger unit often called the “Farewell Discourse,” which covers John 13:31-17:26. As Jesus bids “farewell” to his disciples, he cleanses them through the act of footwashing. The Farewell Discourse concludes with Jesus praying for his followers to continue his mission. The discourse itself features Jesus preparing his followers for his departure by teaching them about their relationship to the Father, to Jesus, to the Spirit, to one another, and to the world. The description of the footwashing is intertwined with Jesus’ predictions about his betrayal, something that the other Gospels recount with the institution of the “Lord’s Supper.” John’s Gospel places the footwashing at a meal, but does not include the explicit establishment of the Lord’s Supper. However, the act of footwashing symbolizes Jesus’ humble self-sacrificial service through his death on the cross – something also symbolized by the bread and cup of the Lord’s Supper. In his commentary on John, Craig Keener (2003, 902-914) observes that the interspersing of the footwashing and its significance (13:3-10) with the betrayal (13:2, 10-11) point to Jesus’ impending death. The betrayal of a friend or close associate was a terrible act in all first-century cultures and the act was especially heinous because it took place during a meal. Eating together was a symbol of trust and unity. And yet, Jesus did not make a mistake in choosing Judas (6:70) since he was chosen to fulfill the prophesied role of betrayer, as the quotation of Psalm 41:9 in John 13:18 points out. Jesus tells his disciples beforehand about this betrayal so that they would not doubt Jesus because of this betrayal. Instead, Jesus’ foretelling would cause them to believe “I am he” (13:19). At the most basic level Jesus was showing that he was a legitimate prophet of God despite Judas’ betrayal; Jesus was still aware and in control of the situation. Telling of the events before hand was one way prophets were shown to be from God (Deut 18:22). Keener (2003, 914) also states this language of Jesus “choosing” the disciples echoes the language of God choosing Israel as he was creating a covenant community. The choosing of Judas and the crucifixion – they were all a part of God’s plan to draw together a new community/family of God. By introducing the idea of voluntary humble service through footwashing, John emphasizes that the betrayal and death were consciously taken up by Jesus in love and service to God’s people. The humiliation of the cross and its cleansing of sinners were foreshadowed in the act of footwashing. Jesus’ footwashing also serves as an object lesson in humility. Footwashing was the task usually done by the lowest servant. It was certainly not to be done by a renowned teacher or leader. Jesus says in John 13:14-15 “If I then, the Lord and the Teacher, washed your feet, you also ought to wash one another’s feet. For I gave you an example that you also should do as I did to you.” Jesus clearly states that one purpose for washing their feet is to give them an example they should follow. Only through humble, Christ-like service could the disciples truly continue Jesus’ ministry and mission. Ending on a note of application, we church leaders must receive Jesus’ cleansing like anyone else. It is through Christ’s sacrificial death (the Lamb of God) that we are cleansed and adopted as children of God (John 1:12; 29). Christian leaders must be converted and cleansed by Christ. Too many have seized the mantle of leadership without having received Christ’s cleansing. We must also pay close attention to Jesus’ example. Jesus calls us to servant-leadership that is ready to humble oneself in service to the other. This includes doing the tasks no one else wants – the task of the lowest servant like washing the feet. Too many have seized the mantle of Christian leadership without taking up the mantle of service like Christ. Christ-like leadership is servant leadership. Jesus as the Heavenly Temple in the Fourth Gospel. The most recent edition of Bulletin of Biblical Research (28.3; 2018: pages 425-446) contains probably my last article that incorporates a large amount of material from my dissertation. Through many revisions, I was able to sharpen one of the main arguments in my thesis into an article length presentation. Below is the abstract/summary of the article. The full article can be read on JSTOR or by those who have a subscription to the Bulletin of Biblical Research. For those who have access to neither, but want the full pdf., leave a comment below and I can email you a copy. ABSTRACT: The majority of Johannine scholars agree that the Fourth Gospel presents Jesus as fulfilling the temple. This article argues that the Fourth Gospel advances this fulfilment by closely associating Jesus with the heavenly temple more than the earthly. The thesis coheres with many previous studies but furthers the discussion by focusing on how the heavenly temple emphasis interacts with the temple-fulfillment theme. The Johannine Jesus embodied the more transcendent reality of the heavenly temple, and his return to heaven began the eschatological expansion of God’s temple presence through the Spirit. This argument is supported by (1) pointing to the pervasive importance placed on the heavenly temple in the first century, (2) examining specific temple-fulfillment texts and consistent motifs/terminology in the Fourth Gospel, and (3) showing how the correlation of Jesus with the heavenly temple better accounts for the post-resurrection fulfillment assumed in the temple-related texts. Did God dwell in the second temple? My latest article, “Did God dwell in the second temple? Clarifying the relationship between theophany and temple dwelling,” appears in this month’s Journal of the Evangelical Theological Society. Unlike the tabernacle or Solomon’s temple, the Bible does not describe the glory cloud of the Lord filling the second temple. This difference has caused many commentators to ask whether God’s presence “dwelled” in the second temple. An accurate answer requires a clarification of what temple dwelling means during the Second Temple period. A broad analysis of temple theology within the biblical and Second Temple literature reveals that the glory cloud relates to theophany, which is only one part of broader “presence” and “dwelling” concepts. The interplay between these concepts and developments in temple theology shifted the meaning of “dwelling.” This shift provided the avenue by which first century Jews could believe that the glory cloud was never manifested and that God still “dwelled” in the second temple. Understanding these beliefs should give interpreters pause when assigning significance to the lack of a cloud theophany in the second temple. In practice, placing more significance on the glory cloud than historically warranted raises other interpretive issues—especially for evangelical interpreters. The full issue of JETS can be found at: https://www.etsjets.org/JETS_current_non. In today’s post, I draw your attention to a new book that examines second century Christianity: Michael Kruger’s Christianity at the Crossroads: How the Second Century Shaped the Future of the Church. Downers Grove: Intervarsity, 2018. While Christianity was born in the first century, the second century was a crucial time of transition and development. Unfortunately most Christians are unaware of the second century’s huge influence on the past and present of their faith. Michael Kruger’s latest work, Christianity at the Crossroads, helps rectify the situation by providing an easy-to-read introduction to this time period. Between the testaments, the concept of the “Messiah” grew and developed significantly. The term “Messiah” was based on the Hebrew word for “anointed one.” In the OT, priests, kings, and prophets could be anointed as a testimony that God had set them apart for that role. Beyond this general concept of anointing leaders, some prophets looked forward to a Davidic king (presumably an “anointed one”) who would lead a restoration of Israel (Psalm 2; Isa 9:6-7; 11:1-10; Jer 23:5-6; 33:14-18; Ezek 34:23-26;37:24-28; Zech 12:7-10). When we turn to the NT, the term “Messiah” (most often in its Greek form “Christ”) has taken on much more prominence and specificity. In fact, only pointing out one or two specific passages that use the term Messiah/Christ might be misleading since the term is used over 500 times! In addition to increased frequency, the concept of the Messiah has developed. The Messiah as described in the NT is assumed to be God’s chosen leader who would usher in the salvation and judgment of God at the eschatological climax of human history (DNTB, 698-705). Given the historical and religious context, the development of the concept of Messiah was inevitable. The OT seeds of promise concerning a coming time of judgment and restoration under a Davidic king took root and grew in the soil of the second temple period. Despite a return to the Promised Land, the Jewish people still experienced hardship and oppression from foreign rulers. Even when Israel achieved a few decades of independence, the Hasmoneans meddled with the priesthood and eventually fell into infighting and Hellenization. Many Israelites felt like they were still spiritually in exile (Wright, People of God, 268-271). They increasingly desired a truly righteous Davidic king to usher in a time of greater renewal than what they had experienced—a renewal that matched, in depth and scale, what the prophets had predicted (see Isaiah 65-66; Jer 31). For this reason, the hope for a Messiah took on an increasingly eschatological edge. The Jewish people did not just want a newly anointed Jewish king (the Hasmonean kings proved they were not the answer), they wanted THE promised anointed one(s) who would usher in the eschatological renewal. The centuries of reflection and growth of these OT seeds produce the ideas about the Messiah that we read about in the NT and in other second temple Jewish literature as well. Like the NT, the Dead Sea scrolls and OT Pseudepigrapha demonstrate a widespread hope in a righteous anointed one (usually a Davidic king, but sometimes a prophet/priest) who would lead Israel into the eschatological age (CD 2:10; 12:23-13:1; Psalms of Solomon 17-18; 1 Enoch 46-71). The NT writers everywhere and often assume that this widespread Jewish hope has been fulfilled in Jesus of Nazareth. The Gospel writers make the case for this assumption in various ways. John states that the purpose of his Gospel is so that “you may believe that Jesus is the Christ” (John 20:31), and the turning point of both Mark’s and Matthew’s Gospel occurs when Peter confesses that Jesus is the Christ (Matt 16:16; Mark 8:29). The assumption that Jesus is the Christ runs deep in the epistles. In fact, the name “Jesus” is coupled with the title “Christ” so often that it’s as if “Christ” has become a part of Jesus’ name (BDAG, 1091). Jesus’ ministry and resurrection undoubtedly convinced the first followers that Jesus was the Messiah and caused them to develop further the concept of Messiah in light of Jesus’ ministry. For example, Jesus’ death connected to the “suffering servant” of Isaiah 53, so the first disciples came to understand the Messiah as including this aspect. When readers come across the concept of Messiah in the NT, they are encountering a concept that not only developed in the centuries between the testaments, but a concept that was further developed in light of the person and work of Jesus – the Christ. An exposition and application of Haggai 1. Prioritize God and his plan. Today’s post includes the basic sermon manuscript from my recent sermon series on the book of Haggai. 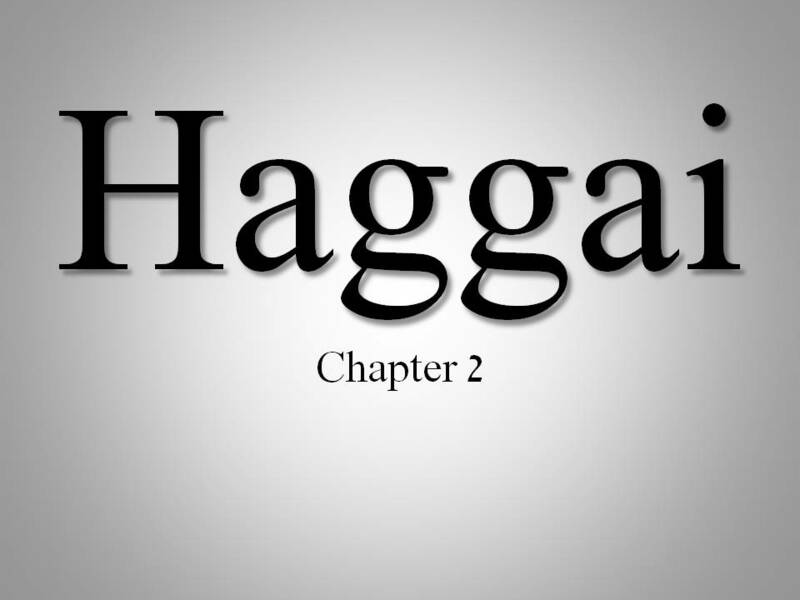 If you are looking for a short, expositional series, then Haggai can be covered in only two weeks. In the actual preaching, I added different illustrations and/or went deeper into certain areas based on the congregation. You can listen to the sermon series at: http://gracefortheway.org/sermons/series/the-book-of-haggai. If you listen and compare the written version below, you will see that any sermon notes or manuscripts are tools to organize a sermon. Just as the Spirit guides in the sermon preparation, the Spirit should guide the proclamation. Intro: Valentine’s day was a couple weeks ago. After 21 years of marriage I still haven’t discovered the secret to making one’s spouse feel special and extra-loved on Valentine’s day. But I have discovered several things NOT to do. When your spouse says, “Today is a Valentine’s day, let’s go out tonight and have a nice dinner.” Do not reply, “I already went out for lunch with the guys, but I’ll bring you home leftovers; they’re really good.” It has only taken me 21 years to come to the amazing realization that my wife does not feel valued when I treat her like an afterthought. If you love and value someone, they are a priority.